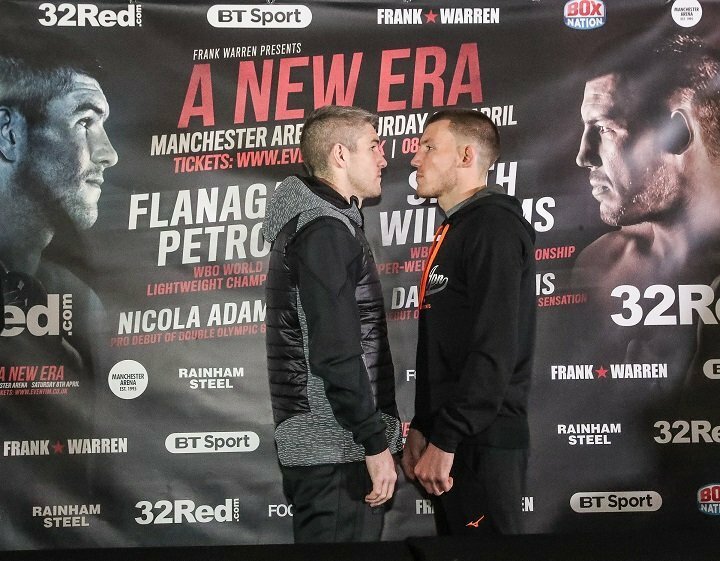 The mouth-watering showdown between former WBO Super-Welterweight Champion Liam Smith and the undefeated British and WBO European Champion Liam Williams will go ahead tomorrow evening at the Manchester Arena, live on BT Sport and BoxNation. Liverpool’s Smith narrowly missed the Championship Weight and therefore the WBO Interim title will only be on the line for Williams. Should Smith win the contest, the title will remain vacant. The unbeaten Welshman Williams weighed-in at 10st 12lbs 8oz and will become the WBO Interim Super-Welterweight World Champion if he beats Smith in what is sure to be a Fight of the Year contender. Saturday’s salivating WBO Super-Welter interim title shoot out between seasoned Scouse star Liam Smith and rising Welsh warmonger Liam Williams at the Manchester Arena promises skill and savagery in equal measure. Ahead of the BT and BoxNation screened showdown, Glynn Evans canvassed a dozen industry insiders for advice on where best to invest his punting pound. Billy Joe Saunders (Unbeaten WBO Middleweight Champion): This is a real 50-50 fight. Liam Smith knows his distance and works inside very well. He’s the rightful favourite going in. He’s operated at a higher level and has more fights, more experience. But if ‘Beefy’ underestimates Liam Williams in any way, he’s likely to come unstuck. That Welsh boy is a very dangerous fighter, on a good run, brimming with confidence. He’s got an excellent coach in Gary Lockett and they’re sure to come up with a top game plan. Seriously, if you gave me a pound to bet, I’d put 50p on both of them! Jimmy Kilrain Kelly (Former World Super-Welterweight Challenger): Close one. When I challenged Liam Smith for his world title, what threw me was his excellent timing and distance. He looks quite slow on tape but he’s much quicker and cleverer than he seems. That said, I expected he’d hit harder. He’s not a big puncher. I lean to Williams. It’s just a gut feeling I have and I always go with my gut. At the press conference, the Welsh kid appeared huge when they were stood together. He’s really wide across the chest and back. He comes across as tough and relentless – he attacks the body well – but he has decent skills, too. He’s also carrying the momentum. As ‘Beefy’ went nine rounds with ‘Canelo’, pushing him back at times, I doubt Williams stops him. Williams on points. Ensley Bingham (Former World Super-Welterweight Challenger): This is going to be an excellent fight. I like Liam Williams’ aggressive style and I’m sure he’ll want to make his mark. Smith is a quality operator; good all-round ability, a good punch picker with a tight defence and spiteful body shots. I think the fight will come down to what the defeat to ‘Canelo’ took out of Smith. A knockout defeat can leave an adverse mark. Williams is a good guy and his time will come but, right now, he needs more seasoning. I expect Smith’s greater experience will see him home on points. Josh Warrington (Unbeaten World Featherweight Contender): It’s gonna be a barnstormer, edge of the seat stuff. These two could fight in a phone box. I’ve not seen a massive amount of Liam Williams but I’ve been very impressed. He’s entertaining, throws a lot of punches and doesn’t mind getting his hands dirty. He’ll take a couple to land his own hard shots. I have to be on ‘Beefy’ (Smith). He’s got the greater experience and is more proven in tougher fights. He gave it a very good go against ‘Canelo’. He can do a lot of stuff; box or scrap. I imagine that the second half of the fight will determine who wins and I expect it to be very close. I see Smith winning but I’m not sure how. Martin Bowers (Trainer): It’s just my opinion, but I believe Smith had the easier route to the British title and the one time he had an acid test, he took a bit of a hiding, albeit to an outstanding fighter. Smith performed with great credit against Alvarez, no disgrace, but might have done better if he’d had stiffer tests on the way through. He was under matched. So my money is on Liam Williams. He’s very solid and consistent in everything he does. He’s prepared to sit in the pocket and have a go. I’ve a hunch that Smith might be too brave for his own good, sit with him and come unstuck. I think the Welsh kid stops him. Peter Fury (Trainer): Oh, this is a hard fight. It’s going to be a humdinger, this. I’ll definitely be tuning in, live. There’s a lot of ‘needle’ brewing already so, either way, I see it ending on a stoppage. I edge ever so slightly towards Smith because, having been in with the likes of ‘Canelo’, he brings the greater experience. He’s a very rugged, tough kid. You could certainly say the same about Liam Williams, who’s calm in battle, has a good boxing brain and I believe will get to world level himself eventually. But he’s an unknown quantity under pressure and that’s why I sway to Smith. Jack Catterall (Undefeated Super-Lightweight Prospect): Both have the power to stop the other so I see it ending early either way. Liam Smith might be coming off a knockout loss to ‘Canelo’ but he’s still fought at a higher level and brings all that experience from training in the US gyms. He’s a smart fighter who knows what it takes. Though he’s aggressive, he thinks about what he does. I’ve not seen too much of Liam Williams but we know he can lose his head. Smith keeps patient when things aren’t going his way and that might be decisive. Ryan Rhodes (Former World Super-Welter Challenger): Immediately it was made I thought: ‘Great fight’! Liam Williams is on a massive high at the moment. I think he’s gonna develop into a top fighter. He’s aggressive but also has a good brain and knows when to attack. Against that, you’ve got Liam Smith coming off a knockout defeat to ‘Canelo’ and we don’t know how he’ll respond. At his best, Smith’s a great fighter; talented, good fitness, smart. He’s not the biggest puncher but he works the body especially well. Will experience play a factor here? I think it will. Brendan Ingle always said: ‘You can’t buy experience’. Smith’s a former world champion. He’s fought at the higher level on the bigger shows. In the close, hard rounds, he’ll know when to work, when to hold back. It’ll go the distance, 100%, and I think Smith will edge it. Can’t wait! Gary Corcoran (Ex British Super-Welterweight Challenger): I’m split down the middle here because I’m not keen on either of them! I actually think Liam Williams is gonna beat him. Smith is good at blocking but sits back too much and Williams lands good straight one-twos through the guard. That’s what he does best. It depends if Williams can control himself. He’s a hot headed fella! Williams is the bigger puncher but I doubt he stops Smith unless the ref jumps in. Kell Brook hit me ten times harder than Williams did. I’m a natural welter – I’m dropping back down – and Williams was far heavier in the ring on the night we fought. It was too much of an advantage to concede. Terry Flanagan (Unbeaten WBO Lightweight Champion): It’s gonna be a great fight to get ‘em warmed up for my main event! Liam Smith is a slight favourite going into the fight. His shot selection is probably the best of any boxer in Britain. He’s very good at everything he does. ‘Canelo’ just happened to be another level above him. Alvarez is pound-for-pound, ain’t he? Williams is tough, strong and can bang you out with either hand but if you’re forcing me to put a pound on it, I’ll go with Smith on points. Liam Walsh (Unbeaten Mandatory IBF Super-Featherweight Contender): This is a cracking fight that can’t fail to deliver. Neither come to dance around and I just wish the other champions would take a leaf out of their book and give the fans the fights they crave. Hopefully, they’ll get awards for it. I’ve been so impressed with Liam Williams since I saw him smash up Ronnie Heffron in Manchester. He can box beautifully but he can also chuck the jacket off if he needs to. He’s huge at the weight and punches very hard. Liam Smith has an advantage in big fight experience. I studied him up close at Gallagher’s gym, sparring his brothers and he’s brilliant at all the subtle stuff that the normal fan might miss; the little nudges off balance, stabs to the body, before attacking you. His punch selection and the manner he switches balance are brilliant. No disgrace losing to ‘Canelo’ in his back yard, either. Both are front foot heavy, like to trade in the pocket and I just hope the winner gets a good reward. I slightly favour Liam Smith on points. At this stage, he probably has the better boxing IQ. Anthony Farnell (Trainer): This is gonna be a brutal shootout, definitely a stoppage. When the fight was made, I’d probably have said Williams because he’s so fresh and hungry whereas Smith is coming off the stoppage loss to Alvarez. But I watched ‘Beefy’ sparring (12-0 Irish super-middleweight)Jason Quigley on Instagram and he looked sensational. His feet were fast and his hands were super sharp. It doesn’t appear that the defeat to ‘Canelo’ took anything out of him. He’ll have learnt loads walking out to 50,000 in Texas. He did really well against one of the very best pound-for-pound. He weren’t shown up. And he’s a tough, hard kid, mentally and physically. When he defended his British against my Mark Thompson, I deliberately tried to rattle him at the pressers and weigh-in but ‘Beefy’ was having none of it, brushed it off. They’re a real match for each other, both very aggressive but, while Williams is extremely strong and tenacious, Smith is cuter. Williams has never been in a fight like this before. Experience wins this for Smith. FINAL SCORE: SMITH 8 WILLIAMS 3, (One Undecided). Everyone, it appears, has a take on the forthcoming shootout between feuding super-welters Liam Smith and Liam Williams who clash for the WBO ‘interim’ title on the mega Manchester Arena fight festival on April 8th, but ex world title challenger Jimmy Kilrain Kelly’s opinion is more informed than most, writes Glynn Evans. The 24 year old former WBC Youth champ from Wythenshawe squared off with Welsh warlord Williams in a schoolboy amateur international and, 16 months back, made a valiant tilt for ‘Beefy’ Smith’s WBO title (lrsc7). The stylish six footer features on the undercard in a crossroads local derby with Penrith’s Rick Godding and intends to warm up the crowd before nestling into a ringside seat and savoring the spicy Anglo-Welsh showdown that has split the trade. ‘It’s definitely going to be a belter. I’ve followed Liam Williams pretty closely since he beat me in the Schoolboy Four Nations when we were just 11 or 12. I was English champion he was Welsh champion but I’d only had six or seven contests whereas he’d had 20 odd and had won the British (Four Nations) the year before. He beat me on points. Even back then, he was a very strong kid. ‘Today, he’s a different fighter and he’s carrying all the momentum into the fight. When the two Liams stood together at the initial press conference, Liam Williams appeared massive, dead wide, far bigger. ‘Liam (Williams) and me both sparred Kell Brook before he challenged (Gennady) Golovkin and we chatted. He’s a really likeable guy, which I can’t say about the other Liam. I’m hoping Liam Williams wins. ‘But Liam Smith is a very good fighter with a world class team behind him, something I didn’t have at the time. It was a big jump up for me and Liam had more dimensions at the time. No excuses, it just wasn’t my night. ‘A lot will depend on what the knockout loss to ‘Canelo’ (Alvarez) has taken out of Smith. We’ll not know until the fight starts. Liam Smith usually begins slowly but so I expect it’ll be cagey for the first three or four rounds, then it’ll erupt. Carnage will break out!